< Sophie the SAR dog in training at 4 months of age. © photo by Desiree. Allex Michael: After seeing the official web site of the Wilderness Search Dog Team, a K-9 handler named Desiree emailed about working with Rhodesian Ridgebacks. Her first SAR dog (search and rescue) was a pit bull, and she is now training a year old ridgeback in the SE United States. Edited for the web, Desiree and my conversations reveal a great deal about Rhodesian ridgebacks. 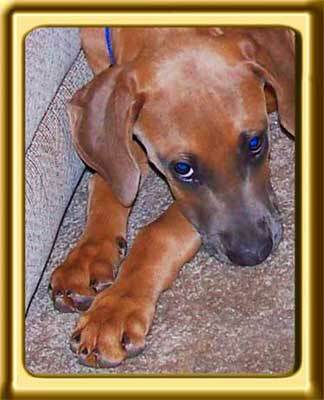 Behaviors YOU should know about BEFORE getting a ridgeback. 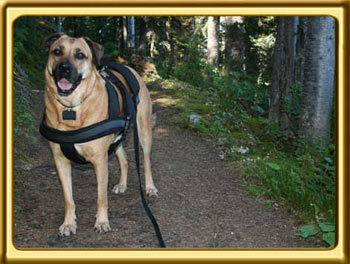 > A ridgeback cross, Ebbey the canine actor out hiking in a forest. Ebbey plays a search dog in the new film SEARCH DOG'S RAVEN: the Eerie Story of a Wilderness Search Dog Team. Ebbey's Heritage. Desiree: How difficult was your Rhodie to train as compared to more popular breeds like bloodhounds, labs or GSDs (German Shepherds)? There is so much breed prejudice in this field! Did you have any issues socializing your Rhodie? Mine hit six and a half months old and decided out of the blue that she is wary of strangers, especially men, but still loves victims. This was in spite of heavy-duty prior socialization. I've heard from breeders and rescuers that they go through a freaky adolecent stage but outgrow it at around two. Any tips on improving the recall and the heel? We've got everything else down, and we've worked extensively on the blasted heel, but we're just not getting it. With the slightest bit of excitement, she's hauling on the lead. Her recall is reliable but slow and tends toward an "I'm coming but let me just see if I can't catch this bunny first" attitude. Any additional info you could give me would be helpful. These are such rare dogs that it's hard to find reliable information, and like I said, I have never met anyone else who works them.